We're now 6 weeks into the school year and I've started off my rendering class at a more reasonable pace than in past years. 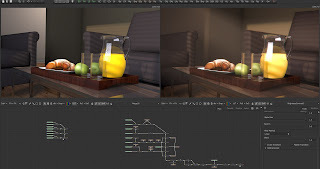 The first series of lessons was to get into the use of mental ray for rendering, however we're not yet using advanced lighting such as Final Gather or Global Illumination (yet). Along with that, the first month was a big introduction to linear workflow. Simply using spot, area, point, and directional lights, we've been looking at how to direct the eye, cast realistic shadows, and look at light colour temperature all while working on our basic material knowledge. 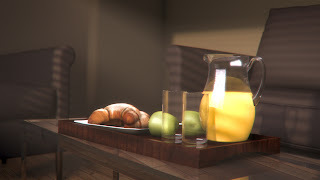 In this still life example I've set up, the students were allowed to use render layers in order to break up background from foreground, and use ambient occlusion to augment the contact shadows. This scene of mine is 4 layers of depth, along with their respective AO layers. In the image above on the left you can see the original layers and what it looked like straight out of Maya. On the right is the Fusion tweaking I've done with masking and colour corrections to try for something a bit more photographic. I find the glass and chrome table on which the breakfast tray is sitting just a bit confusing to look at, however as with so many other projects, it's time to move on. As usual, feedback is welcome.